This site started while I was working overseas in Germany. It was a channel through which I could fantasise about being out on the hills as well as a means of listing my plans for the future. It is unusual in that my site consists of future plans rather than being a blog of hills walked. That said, I am recording my days on the hills as I tick off my to-do list. My migration to Scotland means that I am more able to pick my days, so I hope to be able to add lots of sunny pictures. I will also add details of my days out on smaller local hills such as Ben Bhraggie and any Grahams I choose to climb. I have now set myself the target of completing the Corbetts at the age of 55 (or sooner) before focusing on bad weather Grahams and good weather Munros. I hope to bump into you on the hills sometime! All the routes below include one or more Corbetts. Those shown in bold green have been completed and includes a route report with photographs. *Estimated times are based on the times given by MemoryMap with 50% added on due to carrying overnight gear, rests, taking photographs etc. These are the longest times expected, even in bad weather and heavy loads. I expect to do some routes in much better time, even if walking with my son. For multiple day trips, the sum of the estimated times spent walking are shown. Biking times are not included. The above amounts to 876km and 61116m ascent over 62 days. Adding the routes on this site for the "other hills" and the Lakeland Fells, the grand total is 1288km and 87087m ascent over 111 days. With my current level of activity, this could take the next decade, but things can change (They have! I am now living in Scotland!). By my calculations, the average day consists of 11.6km and 784m ascent. There are some significantly longer days but all fall well within my abilities based on my current level of fitness. The routes above include 23 Munros. 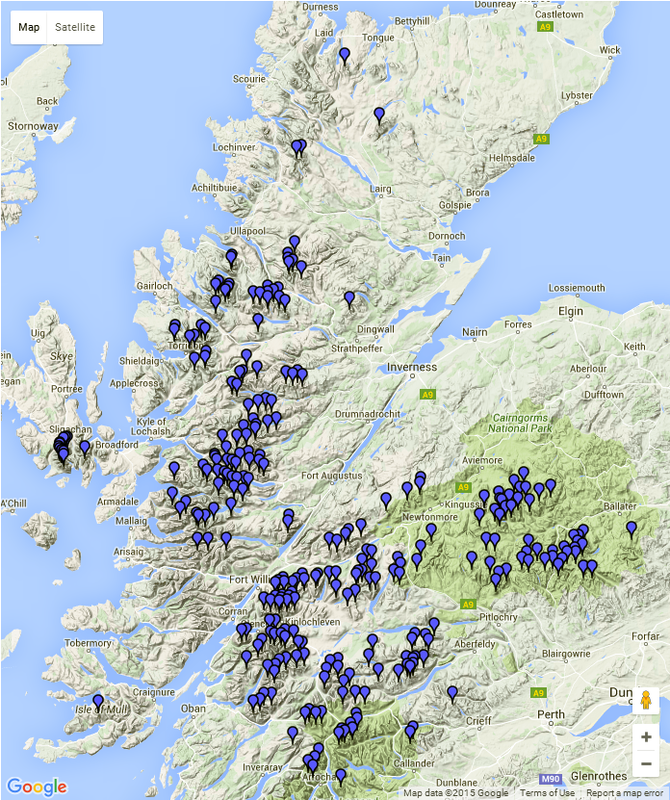 This slightly cluttered map shows the distribution of the Corbetts that I have not climbed and therefore the walks listed on this website. The walking icons correspond to the start of the walks rather than the position of the hills. They involve 68 days of walking to climb 66 Corbetts plus some additional evenings or mornings cycling in to and out from bothies. I have climbed all the Corbetts on the islands, those of the Southern Uplands and all those north of the A835. My current priority is the Corbetts north of the Great Glen but not to the exclusion of the others. I have no particular Hill pencilled in as my final Corbett but probably something fairly south and offering a relatively easy short day on the hill to allow plenty of time to celebrate on the summit. The map below is an alternative means to browse the routes listed on this site. Only the Corbetts are marked. When completing the Munros, I used the 1984 tables and compleated before the 1997 revision. I am glad that I completed the round within the time period of a single revision. As it was, when the list was revised, there was only one of the promoted Munros that I had not climbed - Stob Coire Sgreamhach, which perhaps appropriately became my last Munro top. I was careful to include everything that had ever been a Munro top including several demoted tops. I am aware that Alan Dawson's book Relative hills of Britain identifies a number of significant tops above 3000ft. My personal nomination is the top of a small tor at NO 019 965 on the southern slopes of Derry Cairngorm. The rise of 14m is significant (more than some anyway) and its height is 931m. In the same vein, my main point of reference is the 1984 list but I intend to climb everything that has ever had Corbett status. I climbed Beinn Talaidh before it was demoted to Graham status. I have included Corrieyairack Hill on the map below as it was considered a twin Corbett for many years having the same height as Gairbeinn but having less than a 5ooft (152.4m) drop between them. Kirriereoch Hill was removed from the Corbett list in 1984 and was climbed en route between Shalloch on Minnoch and The Merrick. Broad Law - Cramalt Craig was also removed from the Corbett list in 1984. I climbed this with Broad Law as I continued over to The Thief's Road for my descent. Beinn a'Chumhainn was deleted from the Corbett list in 1981, probably due to an insufficient drop between it and the Munro Sgor Gaibhre (145.4m Alan Dawson 2012). I am 50/50 as to whether I climbed this in the late 80's so perhaps I should go back to make sure. It will be an opportunity to climb Beinn Bheoil as part of my second round of the Munros and to stay at Ben Alder Cottage, which I have visited but not stayed overnight. For a route to Beinn a'Chumhainn, click here. Similarly, Sgor Mor is a deleted Corbett with only a drop of 132m. This can be combined with An Socach. Again, there is a possibility that I have climbed this from Glen Ey, but I probably went up Creag an Fhuathais as this is the most distinctive and appealing ridge in the area. I need to check my records. To see my planned route, click here. Beinn an Tuim is a another that I may or may not have climbed. It was deleted in 1981 and has a drop of 140m. To see a route that includes Streap, click here. Druim Garbh is a deleted Corbett that can be climbed with Sgurr Dhomhnuill in one of my favourite parts of Scotland. I had some wonderful trips exploring Ardgour after completing the Munros. I had previously climbed the Great Ridge of Garbh Bheinn but I had not explored Ardgour and its neighbouring areas of Moidart, Morvern and Ardnamurchan. To see my proposed route to climb Druim Garbh, click here. I have recorded my ascents in the SMC guide "The Corbetts and Other Scottish Hills". As this has been a point of reference, I have climbed many of the "Other Scottish Hills". In my opinion the inclusion of these other hills is a very worthwhile addition and they bring the total number of peaks up towards the number of Munros, adding to the challenge both in terms of distance and ascent as well as involving visits to places such as Eigg and South Uist. 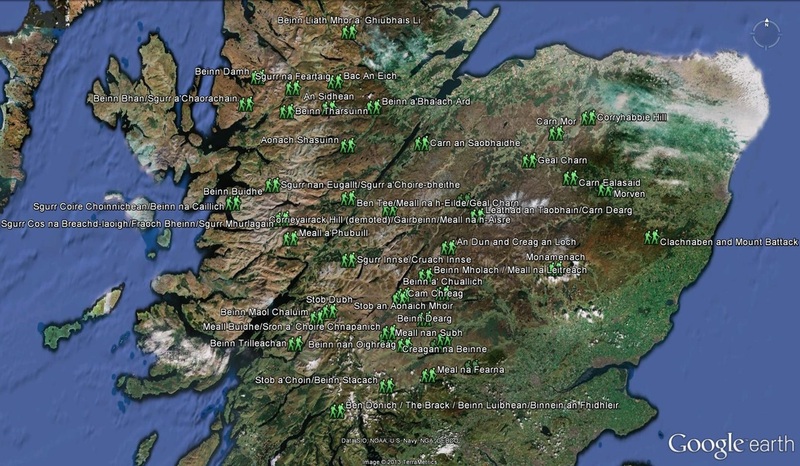 It is my intention to climb all these "Other Scottish Hills" and some of them are included on this site. To see the list of other hills, click here. I am in the process to adding individual Google maps for each route. The OS images are more detailed but the Google maps are perhaps clearer and enable viewers to switch between Map, Satellite and Terrain views as well as view uploaded photographs of the area. Street view can be used to check out the potential parking places and helps one to avoid driving past the starting points. A Google account may be required for this latter feature. ​Occasionally, I climb Munros without any Corbetts so I am adding a Munro Section (currently under construction). ​Click the Munro Map to the right to go to the index of hills climbed.